GOVERNMENT: Independence from Belgium, 1962. Republic with the president elected by popular vote; special election for president by deputies of the National Assembly and governmental ministers held April 2000. Governing bodies: Assemblée Nationale de Transition (legislative body); Council of Ministers and prime minister, appointed by the president. Rwanda is a small landlocked country in East Africa whose scenic alpine landscape led early European observers to call it the “African Switzerland.” In recent years Rwanda’s natural beauty has been marred by a civil war that killed nearly a million people. During the conflict millions of refugees fled to the neighboring countries of BURUNDI, UGANDA, TANZANIA, and CONGO (KINSHASA). Beautiful Lake Kivu forms Rwanda’s western border with Congo. Just east of the lake lie the Virunga Mountains, with peaks rising to nearly 15,000 feet. Although the country is located near the equator, it has a fairly temperate climate because of its high elevation. At the same time, sharp differences in climate and vegetation from one part of Rwanda to another have contributed to the development of distinctive subcultures. Rwanda suffers from an acute shortage of land, a factor that contributed to the civil war that ravaged the nation in 1994. At that time, tiny Rwanda was the most densely populated country in Africa. The shortage of arable land led to social tension. As large numbers of rural people migrated to urban centers, the competition for jobs increased and ethnic differences grew. The history of Rwanda has been shaped largely by the interaction between its two main ETHNIC GROUPS, the Hutu and the Tutsi. During the civil war, leaders on both sides used ethnic differences to stir up hatred between these groups. However, in many ways the causes of the war were more political and cultural than ethnic in nature. Rwanda’s original inhabitants were a hunting and gathering people known as the Twa, a PYGMY group. The Twa were eventually displaced by the Hutu, a BANTU farming people from West-Central Africa who migrated to the region several hundred years ago. In the 1500s or 1600s, the Tutsi, a warrior people who herded livestock, invaded Rwanda from the north. Partly by assimilating the Hutu and Twa, the Tutsi conquered Rwanda and established a highly centralized and hierarchical kingdom. Tutsi overlords forced the Hutu to become serfs—peasant workers bound to the land in a state of semibondage. Each Hutu had to choose a Tutsi lord as a protector. The protector allowed his Hutu serfs to use, but not own, cattle, which were the Tutsi’s highest status symbol and source of wealth. The Tutsi dominance of Rwandan society created great resentment among the Hutu, who were far more numerous than their masters. In 1899 Rwanda became part of the colony of German East Africa. Realizing that the country had an efficient administration run by Tutsi rulers, the Germans decided to leave the existing political structure in place. German officials ruled the colony, but they allowed Tutsi lords to control local affairs. After Germany’s defeat in World War I, the League of Nations appointed Belgium to administer Rwanda and neighboring Burundi, which together became known as Ruanda-Urundi. Like the Germans, the Belgians made use of Tutsi lords as local administrators to reduce the expense of running the colony. However, the society changed somewhat during this time. The Belgian colonial government encouraged the Hutu to grow coffee as a cash crop, which increased Hutu economic power. By the late 1950s, increasing land shortages, combined with longstanding tensions between the Hutu and the Tutsi, laid the groundwork for ethnic warfare. In 1959 the Hutu finally revolted and killed tens of thousands of Tutsi. In this atmosphere of exploding violence, Belgium decided to grant Rwanda its independence. Elections held in 1961 resulted in a landslide victory for the Hutu presidential candidate, Grégoire Kayibanda. For the first time ever, the Hutu majority ruled over their former Tutsi masters. Rwanda gained full independence the following year. The Hutu revolution of 1959 to 1960 forced hundreds of thousands of Tutsi into exile in neighboring countries. These REFUGEES formed the nucleus of a force that would engage in a 30-year struggle against the Hutu government of Rwanda. Meanwhile, President Kayibanda and his Hutu political allies from southern and western Rwanda worked to consolidate their power. Northern Hutu, who had been incorporated into the Tutsi monarchy during the colonial era, held little power in the Kayibanda government. In 1972 ethnic tensions in Rwanda heated up after the Tutsi massacre of thousands of Hutu in neighboring Burundi. Kayibanda’s opponents accused him of not acting decisively against the Tutsi, and the following year a military coup toppled his government. Major General Juvénal Habyarimana took over as president and appointed members of his family and trusted advisers to the most important political positions. Under a new constitution adopted in 1973, only a Hutu could become president. Military rule in Rwanda ended officially in 1975, but Habyarimana and his political party, the MRND, set up a single-party system. In the 1980s conditions in the nation worsened. The price of coffee beans, Rwanda’s major export, fell dramatically on the world market. Meanwhile, Rwandans became increasingly discontented with singleparty rule. In 1990 Tutsi refugees based in Uganda staged an armed invasion of Rwanda. Tutsi refugees in Uganda had formed the Rwandese Alliance of National Unity (RANU). Ugandan rebel leader Yoweri MUSEVENI recruited RANU members for a force that he used to overthrow the Ugandan army in 1986. In return, Museveni gave the RANU members weapons and military equipment to use in their own invasion of Rwanda. In October 1990, some 6,000 of these Tutsi troops, part of a group called the Rwandan Patriotic Front (FPR), streamed into Rwanda and advanced to within 40 miles of Kigali, the capital city. France, Belgium, and Zaire (present-day Congo, Kinshasa) all came to the aid of Rwandan president Habyarimana. Zaire’s president MOBUTU SESE SEKO sent his presidential guard to fight the FPR, while French and Belgian paratroopers arrived in Kigali, supposedly to protect Europeans there. The FPR was stopped, but Habyarimana was forced to end his one-party rule and allow the Tutsi to share power in a democracy. However, many Hutu wanted the Tutsi excluded from the government. Violence and killings continued and then accelerated in 1993, when Tutsi army officers assassinated the Hutu president of Burundi, Melchior Ndadaye. The assassination led to a wave of ethnic violence in Burundi and forced hundreds of thousands of panic-stricken Hutu to seek refuge in Rwanda. In 1994 the violence between Tutsi and Hutu erupted in genocide and civil war in Rwanda. In April 1994, a plane carrying Habyarimana and the new president of Burundi, Cyprien Ntaryamira, was shot down as it approached Kigali airport. Although Hutu rivals of Habyarimana may have been responsible, Hutu leaders blamed the incident on Tutsi rebels. A horrific bloodbath followed, with Hutu death squads killing Tutsi as well as Hutu political rivals. Over the next five months, hundreds of thousands of Tutsi men, women, and children were mercilessly slain. According to one estimate, at the peak of the violence five people per minute were murdered. In response to the atrocities, Tutsi FPR forces launched an offensive that crushed the Rwandan military. In July they seized control of the government. Two million Hutu, fearing attacks from the FPR, fled into Zaire. The new Rwandan government consisted of a coalition of Hutu and Tutsi members, with a Hutu president and prime minister. However, the real power lay with the Tutsi commander of the FPR, Paul Kagame, and his regime became one of the most brutal in Africa. Tutsi also controlled the nation’s various districts and towns. Although the fighting ended in July, violence against the Hutu continued in Rwanda. Local Tutsi leaders had little control over the actions of the military or the FPR. As a result, Hutu were often arrested for no reason and their property given to returning Tutsi refugees. Meanwhile, millions of Hutu refugees remained in exile, fearing that they would not be safe in Rwanda. In Zaire, Hutu leaders began organizing refugees and providing them with military training. When the Zairian government failed to protect the Tutsi from attacks by the Hutu forces, the FPR threw its support to various rebel leaders. Several months after the end of the fighting in Rwanda, the United Nations established the International Criminal Tribunal for Rwanda. Made up of three groups of judges, the tribunal was created to hear cases involving genocide and other violations of international law. 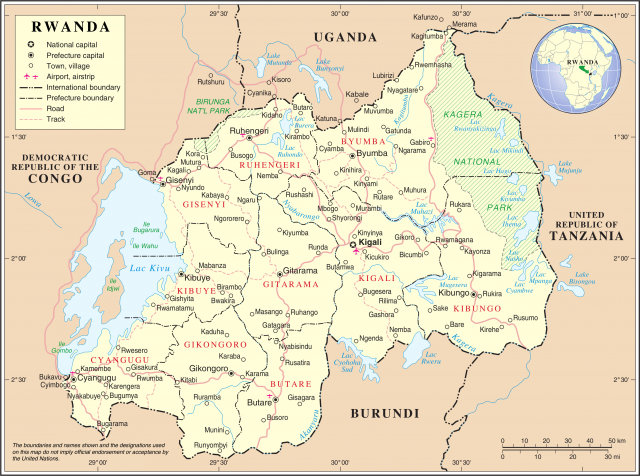 Since 1994 Rwanda has been ruled by a National Unity Government composed of the FPR, the Hutu-controlled Republican Democratic Movement (MDR), and a coalition of other small political parties. In elections held in 1999, Rwandans chose the Hutu leader Pasteur Bizimungu as president and FPR’s Paul Kagame as vice president. Despite a promising start, the government soon broke apart, and President Bizimungu resigned under pressure in March 2000. The parliament then elected Kagame as president, the first Tutsi to hold that office. This election merely confirmed the fact that Kagame had been the true source of power in Rwanda since the civil war. Although Kagame called on all refugees to return home, continued violence against the Hutu in Rwanda has led many Hutu refugees to stay in exile. Reunifying and rebuilding Rwanda will be an enormous task. The economy and judicial system are both in shambles, and the continued presence of Rwandan troops in Congo is a source of friction between the two countries. Massive foreign aid is needed to rebuild Rwanda physically. In addition, healing the wounds of civil war and ethnic hatred will take time. Rwanda’s economy is heavily dependent on agriculture, with coffee and tea the most important crops. Coffee alone accounts for more than half of the country’s export revenue. During the years of ethnic violence, export earnings declined by more than half, coffee revenues fell by over 70 percent, and production of tea decreased by nearly two-thirds. The war left food production in ruins. Before the war, the Hutu formed the bulk of the farming population, but the majority of them either fled the country or were killed during the conflict. As a result, Rwanda’s agricultural output was cut in half, and many fields still remain unplanted. European nations are sponsoring a massive rehabilitation program of investment in agriculture and infrastructure. However, there is some concern that Rwanda’s Tutsi-dominated government will allocate little of that money to the Hutu. Before the civil war, the Hutu made up about 80 percent of Rwanda’s population, the Tutsi accounted for about 19 percent, and the Twa made up the remaining 1 percent. Since the war, however, millions of Hutu have left the country and hundreds of thousands of Tutsi refugees have returned. As a result, the current population may be as much as onequarter Tutsi. The Hutu and Tutsi were once distinguished by physical appearance. The Tutsi were generally tall and slim, while the Hutu were shorter and stockier. However, intermarriage has made it difficult to determine ethnic identity by physical appearance.